we had talked for a long time about putting in a tire swing in the front yard. the gigantic tree in front of our house was just perfect for it, with lots of branches and plenty of room around it. first jackson picked out the green rope we would use to attach it to the tree. then, finally, jackson and dave went over to best foreign auto, the auto parts graveyard behind our house where we often see mashed-up cars getting forklifted high into the air. 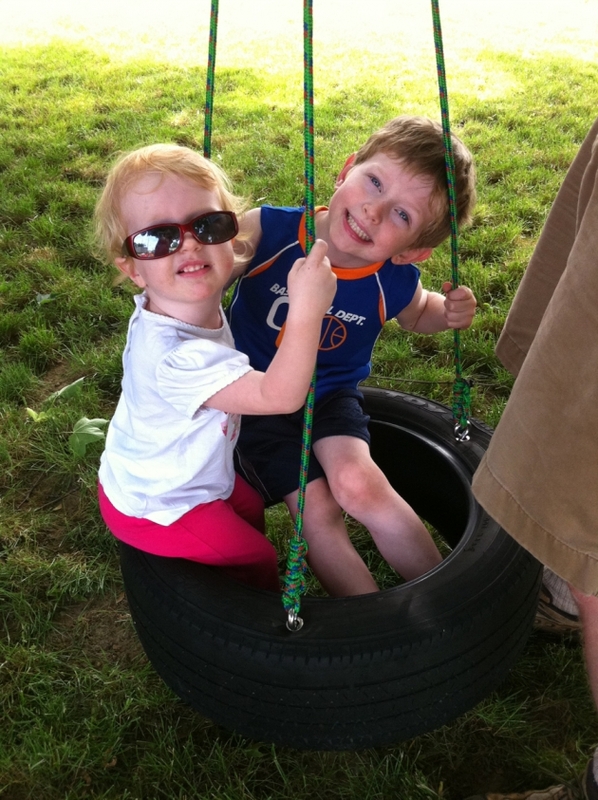 they picked out an old tire from a giant bin for 5 bucks! and we were golden. 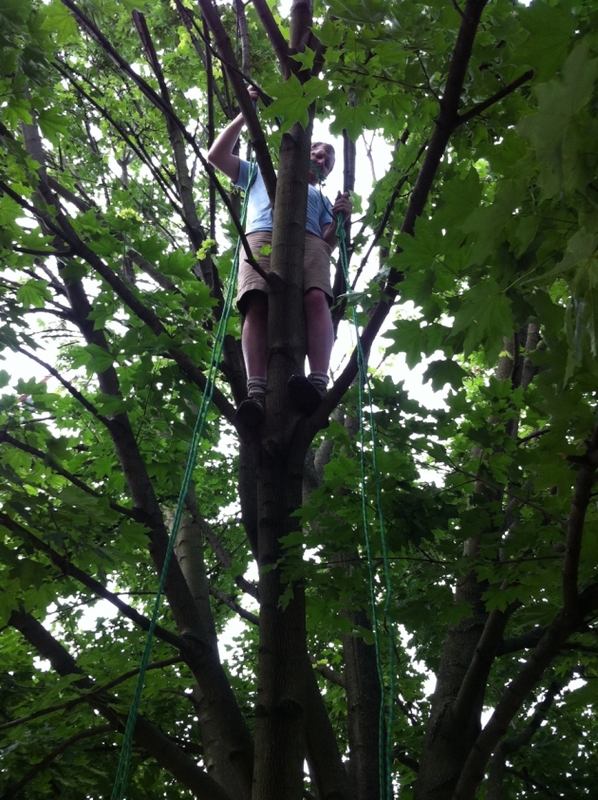 dave’s tree-climbing skills were put to good use, as he attached the swing to a high branch. 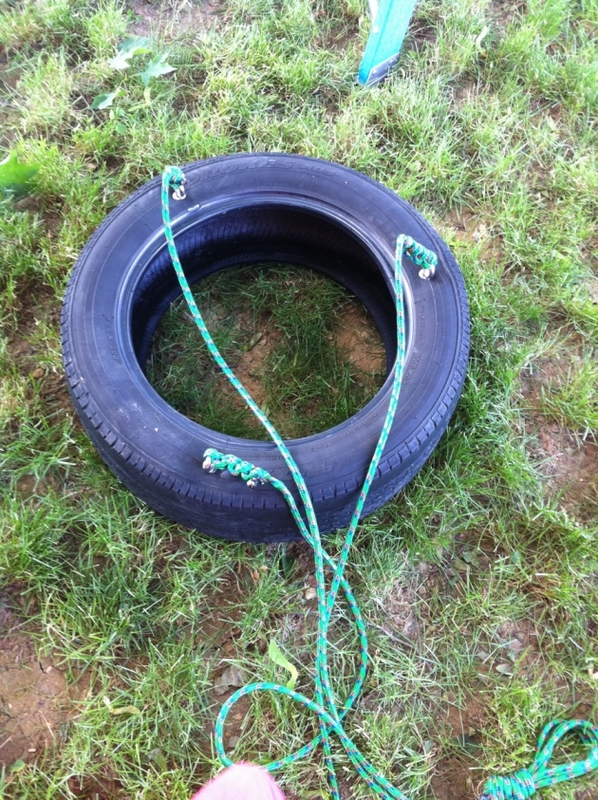 we covered the rope with a rubber bicycle tube, so that where it rubbed against the tree branch, it wouldn’t rip. now, this is a photo in need of a creative caption! getting ready for their first ride! we are all about this movie! the spence’s love the muppets! for the last several weeks, phoebe had been climbing into her big brother’s bed, laying her head on his pillow, pulling up the covers and giving us a huge smile. we took that as a message that she was ready for a big kid bed herself. so, the whole family piled in the car and headed out to our favorite kids’ furniture seller — ikea! the irony here is that phoebe didn’t actually get a new bed, jackson did! always the younger kid, phoebe took the hand-me-down toddler bed that we bought for jackson almost three years ago at ikea. jackson, meanwhile, finally got the bed that matched with the starry tent cover that molly bought a while back, thinking it would fit on his toddler bed (it didn’t). first step was to dismantle the crib! sniff sniff! this being ikea, the new bed came in tons of pieces, of course! jackson and phoebe were daddy’s helpers, and jackson’s excitement level grew as each new piece was put together. patience is a virtue, jackson! taking possession of her new bed already! happy girl! phoebe has slept in her new bed every day for her nap and every night for her long sleep with no problems. she loves it! this video say it all. the kid is thrilled! and here’s the bed, with a nice little built-in ladder and plenty of room underneath for both kids’ mini armchairs. a great spot for reading with giant pooh bear! when our favorite local toy shop dancing bear toys and gifts blogs about something, we listen. this has lead to lots of great toy and game finds, of course. but this week, our friends at the bear blogged about a special crafty art project that could help teach kids about helping others. so, naturally, we headed to the bear this afternoon to get involved. several different kinds of kits were available to choose from, but jackson and molly chose a paint-your-own birdhouse! jackson loved the idea of painting the entire birdhouse red, but, as you can see, the paint tubs that came with the kit were rather small, so we had to get crafty in our planning! jackson grabbed a bunch of his old national geographic kids magazines, and he and molly clipped out photos of some of his favorite animals. then, they grabbed paintbrushes and mod podge, and the house took shape! … and here’s the finished project, full of skunks and frogs and gorillas and zebras and meerkats and elephants and more! thanks to marlene and tom at dancing bear for always providing inspiration and for letting us know about this project. we are excited to submit our finished birdhouse, and to see whether it brings in some big cash for kids in need! Great Job, Jackson and Molly! I love it! Well, I know I for one am bidding BIG on this beautiful birdhouse! Thanks so much for sharing this. this year’s theme for jackson’s valentines is “let your love grow!” and the whole family got in on the act, creating 33 valentines for jackson to distribute today to classmates (30) and teachers (3) at school! molly found mini white seed envelopes on ebay, and jackson helped her buy sunflower seeds at home depot. dave modified the growing directions from the back of the seed packets and printed and cut them to fit on the envelopes. phoebe didn’t want to be left out, of course, and created her own artwork. then she promptly bit the head off one of the (thankfully) washable markers! she’s a crazy little girl! and here they are! we hope you “let your love grow” this valentine’s day! you are always welcome here! we love crafting! Can I come live in at your house? When I grow up and have a family, I hope to be as creative, fun, wholesome, and inspirational as the Spence family! Happy Valentine’s Day!